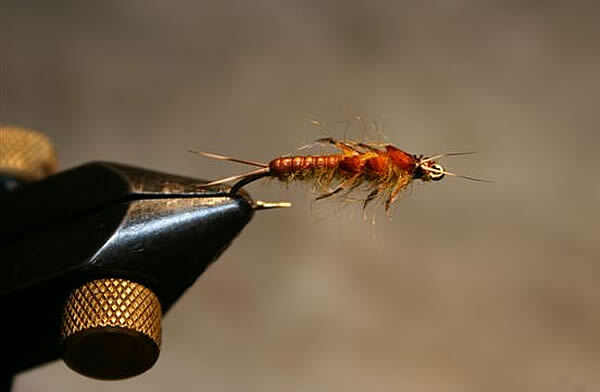 May flies, and to a lesser extent caddis flies, have over the years dominated the attention of fly dressers in South Africa – maybe sometimes disproportionately so. Stomach pumping exercises performed on trout caught inhabiting the fast flowing waters of the North Eastern Cape, as well as regular seine netting, have confirmed, at least in the minds of the authors, the importance of stoneflies in the diet of trout in these river systems. 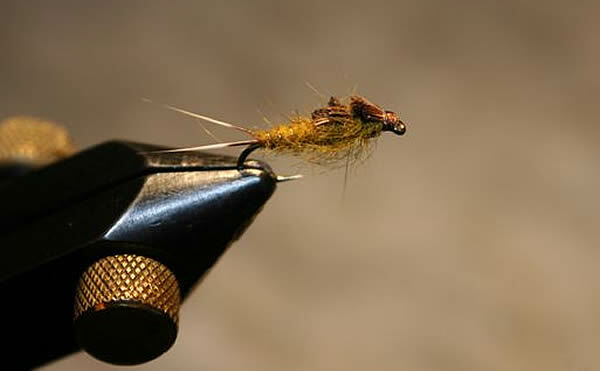 Dave Whitlock (see Guide to Aquatic Trout Foods) , for example, argues that the “… stonefly’s life cycle, habitat, and size make it highly compatible to fly-fishing and fly-tying … maybe even more so than the mayfly.” Careful scrutiny of local literature on fly tying has, however, revealed a paucity of South Africa-specific stonefly nymph imitations. This article presents a short overview of the stonefly life cycle, the stonefly nymph anatomy, the most important families of stoneflies found in South Africa, and a description of the materials required and tying procedure for an impressionistic, South Africa-specific, stonefly nymph imitation. The Latin name for the stonefly is Plecoptera. The latter is broken up into pleco, which means “folded”, and ptera, which means “wings”. The “folded wings”-description refers to a unique physical characteristic present during the adult stage in the stonefly’s life cycle.(i.e. there is no pupal stage), and consists of three distinct phases, namely the egg stage, the nymph stage, and the adult stage. Unlike mayflies, stoneflies hatch all year-round. Hatching, however, occurs mostly during the night, and as such adult stoneflies and their imitations are of little importance to the fly fisherman in South Africa. 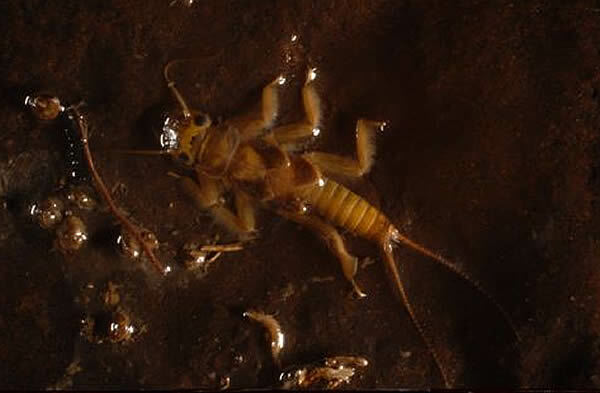 Stonefly nymphs live on the sides and undersides of stream-bottom structures, such as boulders, stones and plant detritus, in swift-flowing mountain and coastal streams and rivers. Stoneflies require unpolluted and swift flowing water with high oxygen content, and for this reason they are often used as an indicator of the relative water quality of a stream or river. Their conspicuous absence from a fast flowing stream or river is a strong indicator of compromised water quality. Stoneflies are seldom, if ever, found in stationary water (i.e. dams or other water impoundments) or very slow moving water – the reason for this absence is the limited level of adaptation of the stonefly’s breathing apparatus to changing water conditions. Due to their limited ability to adapt to varying habitats in comparison to, for example, mayfly nymphs, the nymphs of the different families of stonefly show marginal variation in shape. This almost uniformity in shape across different families makes it easy to distinguish between a mayfly nymph and stonefly nymph. More specifically, the stonefly nymph exhibits the following physical characteristics: The body consists of 1) a head with two long antennae, 2) a clearly segmented thorax with three legs on each side, two well-defined wing pads on top and feathery gills situated on the bottom and between the six legs, 3) and an abdomen consisting of ten clearly defined segments, and two well defined tails on the final segment – gills are also found between the two tails. Stonefly nymphs are easily confused with mayfly nymphs. The former, however, have large, feathery gills under the thorax and between their legs, whereas the gills of the mayfly are situated on the segments comprising the abdomen. Stonefly nymphs have two sets of wing pads compared to the mayfly nymph, which has one set only. Moreover, stoneflies have two tails instead of the three found on most mayflies. The two Stonefly families found in South African waters are the Perlidae family and the Notonemouridae family. The large and robust body of the nymphs of the Perlidae family is approximately 20 to 25mm long, with black and yellow or dark brown on their backs. The upper body is clearly segmented and the two antennae on the head and the two tails on the last segment of the abdomen are highly visible. The photograph below shows a Perlidae stonefly nymph. The nymphs of the Notonemouridae family, on the other hand, are small with a body length of between 5 and 8 mm. The body colour of these nymphs is generally a dull grey or brown. These imitations should be fished in the cushioned boundary layer just above the stream bottom. Furthermore, both patterns are best fished in a drag free drift. The realistic pattern should work well in medium clear water current and the impressionistic pattern will suffice in fast currents where fish have little time examining the fly. Copyright © Linecasters. All Rights Reserved.